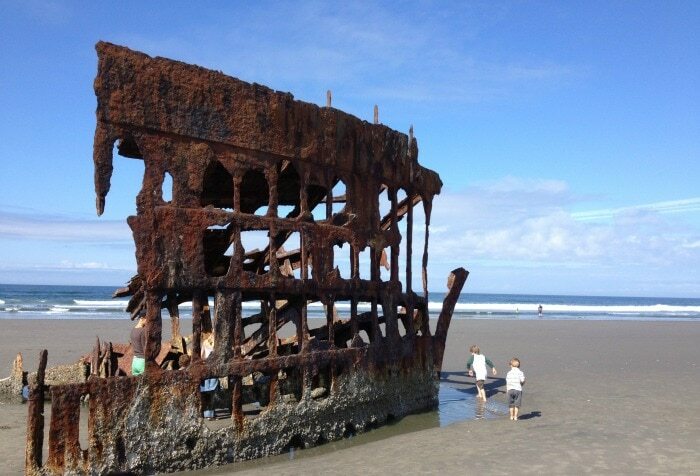 There's so much to explore at Fort Stevens State Park, including the famous Peter Iredale shipwreck on the beach. 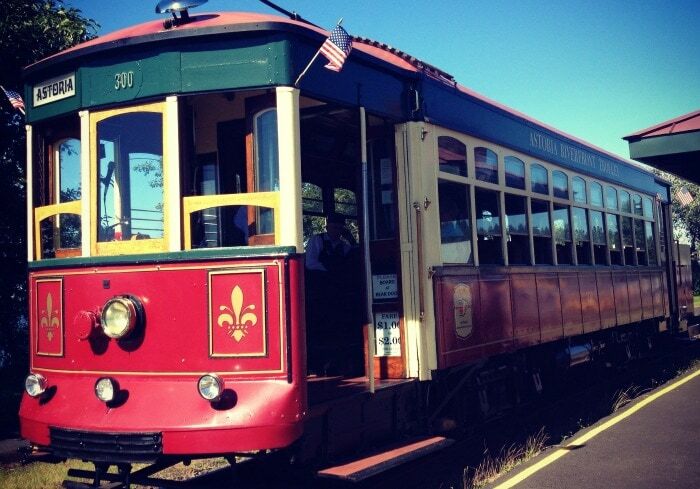 For just $1, you can take a ride on the historic trolley along the beautiful Astoria riverfront. 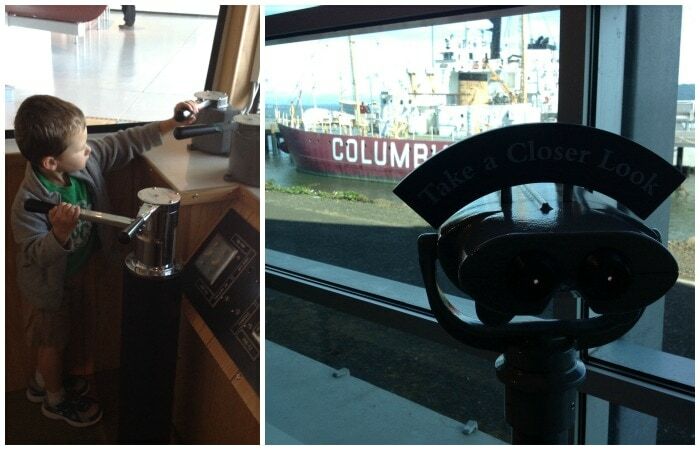 Take a closer look at maritime history at the Columbia River Maritime Museum. The Baked Pizzeria at Baked Alaska is a great stop for families and for watching a classic Oregon Coast sunset. My family loves nothing more than a good old-fashioned road trip, and the beauty of Oregon is that there’s always a new place around the corner that we haven’t yet discovered. And sometimes, we keep going back to one place because it captures our heart. 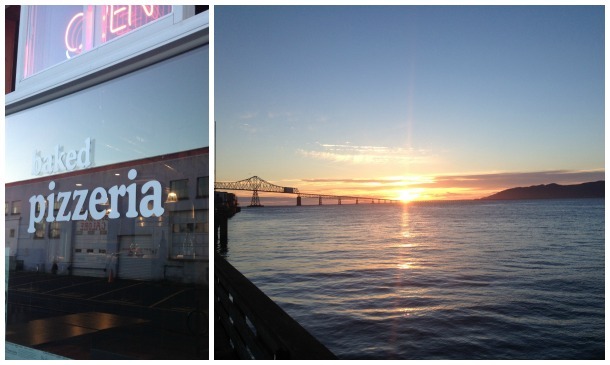 Astoria is like that; authentic, friendly and rich in history, it is quickly becoming one of my family’s favorite destinations on the Oregon Coast. Fort Stevens State Park. There’s so much to do here, you’ll want to plan on most of a day just for this stop alone. Take the kids to all the good hiding and climbing spots on the Battery Russell, to the South Jetty viewpoint to see where the Columbia River meets the Pacific Ocean, and to the sandy beach to see the Peter Iredale shipwreck. You can also camp here – there are tent sites and yurts available (yurt sites fill up quickly, so reserve well in advance). Fort Clatsop. A fascinating walk through history, Fort Clatsop once served as the winter encampment for the Corps of Discovery and is a must for anyone interested in the Lewis & Clark Trail. The Fort to Sea Trail starts here and follows the path the original Corps took after building Fort Clatsop. The entire trail is 6.5 miles long, but we pretended we were explorers by following the easy .5-mile loop walk around the visitor center. Columbia River Maritime Museum. This is truly a world-class maritime museum that will excite both kids and history enthusiasts. This is where I discovered the fascinating history of the treacherous Columbia River Bar, and also where my 3 year-old pretended to captain a ship that was being attacked by a giant squid. Astoria Column. Grab an airplane at the bottom, then climb the 164 steps to the top to launch it from the top, where you’ll be surrounded by amazing views of the Pacific Ocean, the Columbia River and the Cascade Mountains. Perfect photo opp of the entire family at the top of the column. Astoria Riverfront Trolley. The trolley celebrated its 100th birthday in 2013 and still runs along the scenic riverfront, where you can take a ride for just $1. And what kid doesn’t want to ride a trolley? Zip lining at High Life Adventures. This is one of those great activities that bring the entire family together – kids, parents and grandparents alike. Once you conquer the bunny slope, you’ll be flying through the trees like a pro. The Baked Pizzeria at Baked Alaska. This is my kind of family-friendly dining: a fresh, delicious menu for the adults, a nice kids menu and a bookcase stocked with books, toys and games to keep everyone entertained while waiting for dinner. Huge bonus: Baked Alaska offers a beautiful view to watch the sunset over the bridge and river. Fort George Brewery. The restaurant has a casual indoor and outdoor seating area, and there’s foosball and shuffleboard in the taproom for the kids and big kids. And of course, plenty of delicious Oregon craft beer on tap. 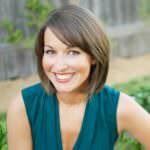 To stay, check out the Holiday Inn Express. Located right under the bridge on the riverfront, they offer room layouts with separated sleeping areas that are perfect for families. After you put the kids to bed, relax and enjoy your view of the sunset on the Columbia River.